The Oscars are just around the corner and if you're in the mood for snacks, we're thinking popcorn. And sure, you can head to the store and buy every type of flavoured popcorn, but what what about whipping up your own batch at home? Cooking with your own kernels won't only make your recipes healthier, but you can mix popcorn with everything from lime juice to hot sauce. Popcorn has often been referred to as the perfect diet snack: it fills you up and doesn't have too many calories. 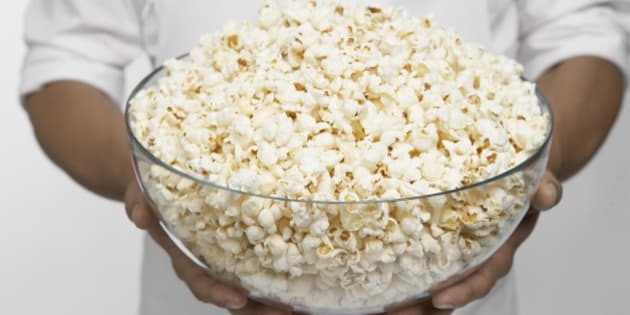 And while some stay away from chemicals or the taste that come with microwavable popcorn bags, there are old-fashioned ways to pop your own corn. And with the right ingredients, this fibre-filled snack can be the perfect appetizer during your Oscar party or keep you company as you snuggle on the couch. In case you missed it, last week we packed cauliflower. If you love eating chili and lime on corn on the cob, you'll love this homemade seasoning recipe. Get the full recipe from Kitchen Heals Soul here. This salted popcorn is made with smoked sea salt — fancy! Get the full recipe from 80 Twenty here. A sweet take on a salty snack. Get the full recipe from Taste.com.au here. If you have a curry craving, you may be able to fulfill it (temporarily) with this popcorn recipe. Get the full recipe from Babble here. Not only will this recipe tickle your taste buds, but you're vegan friends will like it as well. Get the full recipe from Domesticate Me here.